Baton Rouge, La. – Students in 6th – 12th grade are invited to participate in the Southern University Land-Grant Campus’ Back-to-School Summit. 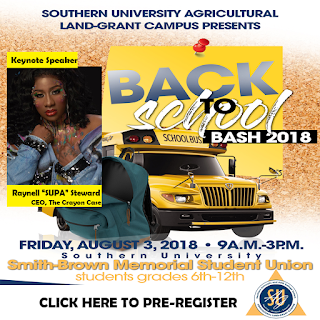 The free event, which is themed “Youth Empowerment and Community Stewardship” Cultivating the Next Generation of Agricultural Leaders: Plant, Grow, Nurture, Harvest, Sustain, will be held from 9 a.m. – 3 p.m. on August 3 in the Smith-Brown Memorial Student Union on the Southern University Baton Rouge campus. City of Baton Rouge Councilwoman Chauna Banks-Daniels will serve as the guest speaker for the summit. Youth interested in attending the Back-to-School Summit must pre-register online at https://www.123formbuilder.com/form-3991992/. For additional information, contact Kayla Fontenot at 337-943-2410 or Nicolette Gordon at 225-803-9844. SU Land-Grant Campus Small Farmer Agricultural Leadership Institute graduate Larry Freeman received the Louisiana Century Farm Award on June 22 in New Orleans, La. Pictured with Freeman on the front row, from the left are, his grandchildren Jaden Freeman, Larry Freeman and Melani Holmes. Standing on the second row are, from left, SULGC Area Agent Burnell Muse, Shirley Freeman, Maya Freeman, Freeman, LDAF Commissioner Mike Strain, D.V.M., and SULGC Associate Extension Specialist Zanetta Augustine. Baton Rouge, La. – Larry Freeman, a graduate of the Southern University Land-Grant Campus' (SULGC) Small Farmer Agricultural Leadership Institute, is one of six recipients of the Louisiana Century Farm Award. The award, which was presented by the Louisiana Department of Agriculture and Forestry (LDAF) and the LSU AgCenter, is given to families who have owned and consistently farmed on Louisiana land for at least 100 years. The Amite, Louisiana resident said he learned about the award from Frank Taylor, director of the Winston County Self Help Cooperative (WCSHC), at one of the Southern University Ag Center’s Parish Field Day’s. “I didn’t know what the award was or what it would bring out,” said Freeman. “Frank, along with Dawn Mellion-Patin at the Southern University Ag Center and Warner Hall encouraged me to apply for the award, but Frank almost just made me do it,” he jokingly added. To qualify for the award, Larry said he had to complete an application and do some research on the ownership of his family’s farm. He was able to find court records showing that his grandfather had purchased approximately 160 acres of land for $1,280; less than 10 years after slavery. “He (Freeman’s grandfather) didn’t know how to write his name so he signed his name with an X,” said Freeman. He was also able to find USDA records showing that his uncle had applied for USDA assistance while farming the land. “I completed the application and they verified that all the information was correct,” he said. Larry, along with the A&F Farms from New Iberia, La. ; Ardoyne Plantation from Schriever, La. ; the Cornist Family from Delhi, La; DeJean Family Farms, LLC from Church Point, La. and the O.E. Williams Trust from Many, La., were presented with plaques on Friday, June 22 during the Louisiana Farm Bureau’s 96th Annual Convention in New Orleans. “A lot of gratitude goes to my grandfather for not selling the land,” said Freeman who noted that he knows several families how have lost their land. The third generation farmer also credits the SULGC's Small Farmer Agricultural Leadership Institute for helping him with the business aspect of his farm. “We are extremely proud of Larry Freeman for being able to keep his land and ever more importantly that he is involving his grandchildren in the farm,” said Dawn Mellion-Patin, Ph.D., Vice Chancellor for Extension at the SULGC and former director of the Small Farmer Agricultural Leadership Institute. Freeman is also a graduate from the LSU AgCenter’s Master Cattleman’s Program and is a member of the Cattleman’s Association. He currently serves as an advocate, encouraging individuals in his community to continue farming their land and to eat heathy. The LDAF has presented 59 families with the Louisiana Century Farm Award since 2014. To be eligible for the award, families must have at least 20 acres of the original founder’s land, produce at least $1,000 in farm income annually and at least one owner must be a resident of Louisiana. Families interested in finding out if their farm is eligible for the award can contact, Lillie Adams Wiley at the LDAF at 318-949-3225 or go to www.lsuagcenter.com. The Louisiana Department of Agriculture and Forestry oversees the state’s agriculture and forestry programs and enforces its regulations. The SULGC’s Small Farmer Agricultural Leadership Institute is a year-long course designed to promote the sustainability of small socially disadvantaged and/or minority owned farms through the enhancement of business management skills, utilization of USDA programs and services and leadership development. To learn more about the Southern University Land-Grant Campus’ Small Farmer Agricultural Leadership Institute, visit http://sualgc.susenterprisecms.com/page/small-farmers or contact Kelli Hollins at 225-771-5782. The Southern University Ag Center and SU College of Agricultural, Family and Consumer Sciences together are called the Southern University Land-Grant Campus.